This story, an alternate history masterpiece, is told from the viewpoints of Korolev, the "Chief" who mananaged the most crucial years of the secret Soviet space program, and his assistant and eventual successor, Aksyonov. The story spans from World War II, when Korolev was released from a prison camp to design rockets, to 1997 and the Mir space station. This endearing story is many tales in one: an historical story that captures the true mood of the period; a science fiction story that resonates on multiple levels with plenty of technology and cosmonaut bravado; and finally, a ghost story as the tales fades away. This story won the 2002 Theodore Sturgeon Memorial Award for best short science fiction story of the year. "Tsiolkovsky," he said. "Your memory is excellent, Comrade Korolev." The man who had held the open book before Korolev’s face reversed it and examined it himself. He wore a full-dress officer’s uniform, and two soldiers flanked him. "Exploration of Cosmic Space with Reactive Devices, by Konstantin Tsiolkovsky. Published 1903. Though you'd be hard-pressed to spot the fantastic elements this tale is a inspirational and deeply moving for any true Science Fiction fan. I'm not a spiritual person, I think that spirit is bunk and people who believe in spirit are all marks. But in a very deeply emotional sense I can almost understand the need for something like the spiritual when I look up into the deep night. There is nothing more powerful than seeing the immensity of existence and then comparing our thus far pitiful explorations to them. Those persons with the will to embrace the larger goals of space travel, by passing by the little miasma of our insignificant apish little goals, to get a shiny new car, a cell phone or an expensive suit are those worthy of worship. One such man was Sergei Korolev, the "Chief designer" of the secret Soviet space program. This story follows his management of the men who would create the universe's only known spacefaring species from 1957's Sputnik forward into what we can only hope would be a bright future. The story spans from World War II, when Korolev was released from a prison camp to design rockets, to 1997 and the Mir space station. Andy Duncan is not someone I'd read anything of prior, but his work here is remarkable. If this wasn't supposed to be Alternate History, and it is very subtle if it is even that, I'd have said the story of Koralev's life history was massaged to provide a more ballistic plot. Though Koralev was sent to the Gulag, as depicted in the opening sentences of this novella, the reason for his departure from it didn't happen, in real life, for the reasons stated in the story. Michael Swanwick called The Chief Designer, "A portrayal ... of the single most positive enterprise of the twentieth century", and he is right, but too limiting, Koralev's genius, along with men like Wernher von Braun was to expand the meaning of humanity from mere animal to demi-god. Before these men, their vision and action, we were just animals with tools and language, afterwards we became creatures capable of refining the metal of the crust of the planet upon which we were born, shaping it into cylinders filled with explosives and sending our representatives to other worlds. 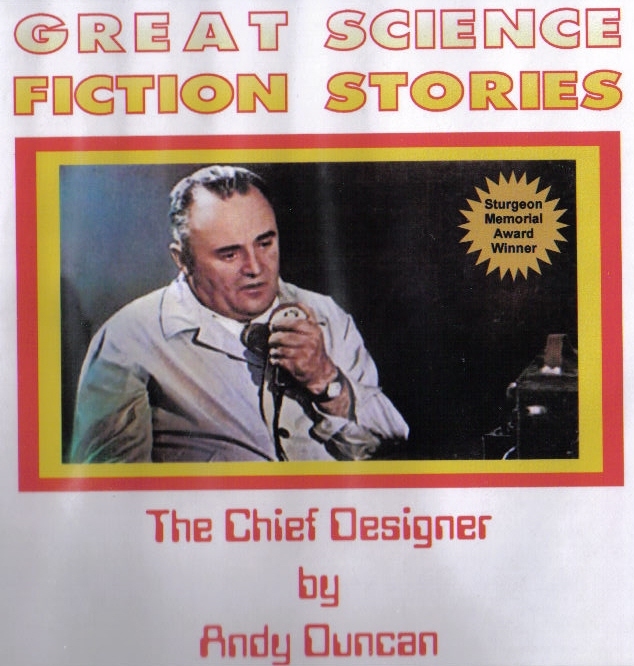 The Chief Designer is a portrayal of the single most important enterprise in human history! Koralev is in a very real sense our real life Titan, our very real and historical Prometheus, stealing fire from the gods and giving it to humanity. The Chief Designer is winner of the 2002 Theodore Sturgeon Memorial Award, the Southeastern Science Fiction Achievement Award, a 2003 Nebula Award finalist and a 2002 Hugo Award finalist. Today we can add SFFaudio Essential to its many achievements.